Mytilene (Greek: Μυτιλήνη, pronounced Mitilini in Modern Greek.) is a town and a former municipality on the island of Lesbos, North Aegean, Greece. Since the 2011 local government reform it is part of the municipality Lesbos, of which it is a municipal unit. It is the capital of the island of Lesbos. Mytilene, whose name is pre-Greek, is built on the southeast edge of the island. It is also the seat of a metropolitan bishop of the Orthodox church. Mytilene is linked with a highway numbered (GR-67) linking to Skala Eressou on the other side of the island of Lesbos. 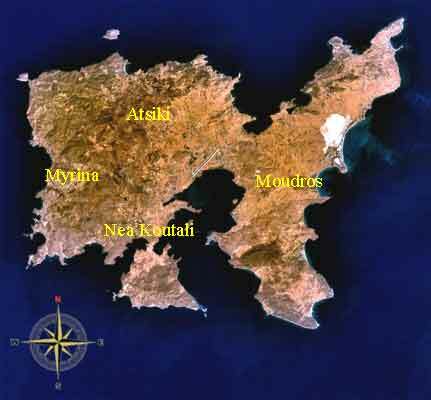 Farmlands surround Mytilene, the mountains cover the west and to the north. The airport is located a few kilometres south of town. The city was called Midilli during Ottoman times. It is located in the southeastern part of the island, north and east of the Bay of Gera. It has a land area of 107.46 square kilometres (41.49 sq mi) and a population of 36,196 inhabitants (2001). With a population density of 336.8/km² it is by far the most densely populated municipal unit in Lesbos. The next largest towns in the municipal unit are Vareiá (pop. 1,254), Pámfila (1,247), Mória (1,207), and Loutrá (1,118). Pittacus of Mytilene (c. 640-568 BC); one of the Seven Sages of Greece. The Cathedral of the city. As an ancient city, lying off the east coast, Mytilene was initially confined to an island that later was joined to Lesbos, creating a north and south harbour. Mytilene contested successfully with Methymna in the north of the island for the leadership of the island in the seventh century BC and became the centre of the island’s prosperous hinterland. Her most famous citizens were the poets Sappho and Alcaeus and the statesman Pittacus (one of the Seven Sages of ancient Greece). The city was famed for its great output of electrum coins struck from the late 6th through mid 4th centuries BC. Mytilene revolted against Athens in 428 BC but was overcome by an Athenian expeditionary force. The Athenian public assembly voted to massacre all the men of the city and to sell the women and children into slavery but changed its mind the next day. A fast trireme sailed the 186 nautical miles (344 km) in less than a day and brought the decision to cancel the massacre. Aristotle lived on Mytilene for two years, 337-335 BC, with his friend and successor, Theophrastus, after becoming the tutor to Alexander, son of King Philip II of Macedon. The Romans, among whom was a young Julius Caesar, successfully besieged Mytilene in 80 BC. Although Mytilene supported the losing side in most of the great wars of the first century BC her statesmen succeeded in convincing Rome of her support of the new ruler of the Mediterranean and the city flourished in Roman times. In AD 56 Paul the Apostle stopped there on the return trip of his third missionary journey(Acts 20:14). The novel Daphnis and Chloe, by Longus, is set in the country around it and opens with a description of the city. In the Middle Ages, it was part of the Byzantine Empire, but in the 9th century the population fled because of the Muslim naval raids. It was occupied for some time by the Seljuqs under Tzachas of Smyrna in 1085. In 1198, the Republic of Venice obtained the right to commerce from the city's port. In the 13th century, it was captured by the emperor of Nicea, Theodore I Laskaris. In 1335 the Byzantines, with the help of Ottoman forces, reconquered the island, then property of the Genoese nobleman Domenico Cattaneo. In 1354 emperor John V Palaiologos ceded Chios to the Genoese adventurer Francesco Gattilusio, who renovated the fortress in 1373. It remained in Genoese hands until 1453, when it captured by the Ottoman sultan Mehmed II. There are 15 primary schools in Mytilene, along with seven lyceums, and eight gymnasiums. [CN] There are six university schools with 3671 undergraduates, the largest in the University of the Aegean). Here also is the Rector, the central administration of the Foundation, the Central Library and the Research Committee of Aegean University. The University of Aegean is housed in privately-owned buildings, in rented buildings located in the city centre, and in modern buildings on University Hill. The Liberty Statue of Mytilene. Archaeological investigations at Mytilene began in the late 19th century when Robert Koldewey (later excavator of Babylon) and a group of German colleagues spent many months on the island preparing plans of the visible remains at various ancient sites like Mytilene. Significant excavations, however, do not seem to have started until after the First World War when in the mid 1920s Evangelides uncovered much of the famous theatre (according to Plutarch it was the inspiration for Pompey's theatre in Rome in 55 BC, the first permanent stone theatre in that city) on the hill on the western side of town. Subsequent work in the 1950s, 1960s and 1970s by various members of the Archaeological Service revealed more of the theatre, including a Roman conversion to a gladiatorial arena. Salvage excavations carried out by the Archaeological Service in many areas of the city have revealed sites going back to the Early Bronze Age although most have been much later (Hellenistic and Roman). Particularly significant is a large stoa over a hundred metres long recently dug on the North Harbour of the city. It is clear from various remains in different parts of the city that Mytilene was indeed laid out on a grid plan as the Roman architect Vitruvius had written. Archaeological excavations carried out between 1984-1994 in the medieval castle of Mytilene by the University of British Columbia and directed by Caroline and Hector Williams revealed a previously unknown sanctuary of Demeter and Kore of late classical/Hellenistic date and the burial chapel of the Gattelusi, the medieval Genoese family that ruled the northern Aegean from the mid 14th-mid 15th centuries of our era. The Demeter sanctuary included five altars for sacrifices to Demeter and Kore and later also to Cybele, the great mother goddesss of Anatolia. Among the discoveries were thousands of oil lamps, terracotta figurines, loom weights and other dedications to the goddesses. Numerous animal bones, especially of piglets, also appeared. The Chapel of St. John served as the church of the castle and as a burial place for the Gattelusi family and its dependents. Although conversion to a mosque after the Ottoman capture of the city in 1462 resulted in the destruction of many graves some remained. The great earthquake of February 1867 damaged the building beyond repair and it was demolished; the Turks built a new mosque over the ruins to replace it later in the 19th century. Other excavations done jointly with the K' Ephoreia of Prehistoric and Classical Antiquities near the North Harbour of the city uncovered a multiperiod site with remains extending from a late Ottoman cemetery (including a "vampire" burial, a middle aged man with 20 cm. spikes through his neck, middle and ankles) to a substantial Roman building constructed around a colonnaded courtyard (probably a tavern/brothel in its final phase in the mid 4th c. CE) to remains of Hellenistic structures and debris from different Hellenistic manufacturing processes (pottery, figurines, cloth making and dyeing, bronze and iron working) to archaic and classical levels with rich collections of Aeolic grey wares. A section of the late classical city wall runs across the site which was close to the channel that divided the mainland from the off shore island part of the city. Considerable remains of the two moles that protected the large North Harbour of the city are still visible just below or just breaking the surface of the sea; it functioned as the commercial harbour of the ancient city although today it is a quiet place where a few small fishing boats are moored. The city has two excellent archaeological museums, one by the south harbour in an old mansion and the other two hundred metres further north in a large new purpose built structure. The former contains the rich Bronze Age remains from Thermi, a site north of Mytilene dug by the British in the 1930s as well as extensive pottery and figurine displays; the former coach house accommodates ancient inscriptions, architectural pieces, and coins. The latter museum is especially rich in mosaics and sculpture, including the famous late Roman mosaic floor from the "House of Menander" with scenes from plays by that Athenian 4th c. BC playwright. There are also mosaics and finds from other Roman mansions excavated by the Archaeological Service under the direction of the archeologist Mme. Aglaia Archontidou-Argyri. Theophanes, middle of first century BC, Greek statesman, close friend of Pompey the Great.